LeBron James could end up with a handful of records that only he would own. By the end of the 2016-17 NBA season — barring an injury to one of the game’s healthiest players — Cleveland Cavaliers star LeBron James will be No. 7 on the league’s all-time scoring list, passing Moses Malone and Shaquille O’Neal. James (27,359 career points) has moved ahead of Elvin Hayes into ninth place and will pass Malone (27,409) soon for eighth. He also became the first front-court player with 7,000 assists as well as the only player in league history with at least 27,000 points, 7,000 rebounds and 7,000 assists. "I’ve played with two great organizations that I’ve been able to do what I do. They’ve allowed me to be the player that I want to be," James told reporters Saturday night. "It just shows that’s the triple threat of me: to rebound, to pass, to put the ball in the hole a little bit. I’m just honored, just blessed, and I just try to continue to give it to my teammates, give it to my fans, give it to this organization every single night that I go out there. "That’s my job, to be the only person ever to put those numbers up. It’s pretty cool because this is the game I love, this is the game I’ve watched my whole life growing up, so um, it’s incredible." So, where will James end up on the all-time scoring list? Can he collect 30,000 points, 10,000 rebounds and 10,000 assists? Don’t ask him. He has long maintained he doesn’t project like that, saying he leaves it to the sports media to discuss it now. But he has said he will sit down after his playing days are done to talk about his career and accomplishments in-depth. Let’s do the projecting for him. Next season, if James, who turns 32 on Dec. 30, averages at least 23 points and plays in at least 72 games — there’s no reason he shouldn’t considering he said this is the best he’s felt in two seasons — he will finish 2017-18 with more than 30,000 points. He’ll likely still be behind Dirk Nowitzki on the all-time list. 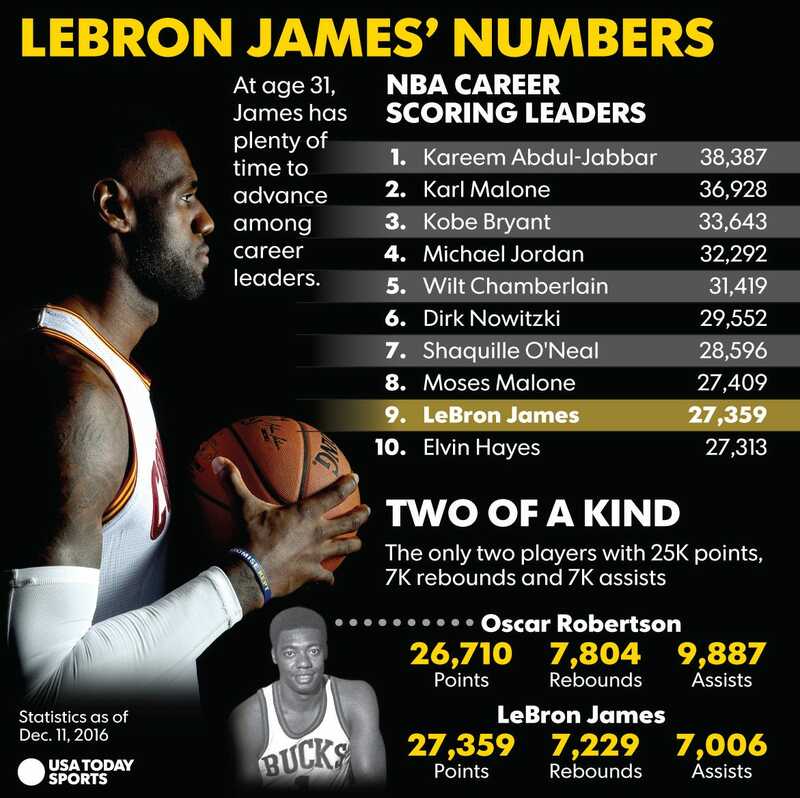 After the 2018-19 season, James should be close to 32,000 points, moving ahead of Nowitzki and Wilt Chamberlain into the fifth spot, leaving him behind Michael Jordan (32,292), Kobe Bryant (33,643), Karl Malone (36,928) and Kareem Abdul-Jabbar (38,387). Passing Bryant is realistic. But getting to Malone and Abdul-Jabbar will require longevity and scoring consistency. There’s a 3,285-point difference between second and third place. Malone was 40 years old in his final season and Abdul-Jabbar 42. As James gets older, it’s reasonable to believe his scoring average will decline. But not that much in the next few seasons. He should still be a 20-points per game scorer for the next five seasons, and his offensive game will evolve. Malone put up 25.5 points per game at 36 years old and 20.6 at 39. If James averages at least 23 points in 2017-18 and 2018-19 and then 20 points a game for the next five seasons playing at least 70 games a year through 2023-24 — he’ll turn 39 that season — he would pass Abdul-Jabbar. What about 10,000 rebounds and 10,000 assists? Doable. If James averages seven rebounds and seven assists while playing about 70 games a season through 2022-23, it will happen. The assists are expected to rise faster than rebounds. He’s averaging 2.3 more assists this season than last as teammates Kyrie Irving and Kevin Love increase their scoring averages. All this, of course, depends on several variables. James’ health is first and foremost, though he has been remarkably durable. In that regard, he’s a lot like Malone, who never played fewer than 80 games in a season, minus a lockout season and his final season. But it’s also James’ ability to play at a high level. It’s difficult to envision James continuing to play if he’s not at an All-Star level or close to it. How long does he even want to play? Regardless, it will be interesting tracking his points, rebounds and assists as he piles up unprecedented statistics.